Ice Storm can help you bring that dream ring to reality. We let our work speak for itself. Any size, any setting, any design, the sky is the limit. It's our specialty. A special moment, a special woman, requires a special ring. A passion at Ice Storm has long been working with clients to provide the ultimate engagement ring. It can be a daunting task. We know you want the moment to be as perfect as you had imagined your entire life. This moment is special and we leave sales tactics for your local jeweler and big box retailers. We ensure to take time consulting with our customers to ensure that they are completely satisfied throughout the entire process. Most of the customers have little to no prior knowledge when it comes to diamonds. The process can be a bit nerve racking. Most of the industry is made up of sales tactics that can leave you feeling like you've been robbed blind. Our goal is to educate our clients. We will make sure you understand the 4 Cs (Color, Clarity, Cut, and Carat Weight) amongst other details where necessary. All center stones are GIA certified unless requested otherwise. We will always leave the final decision to you, but we want to ensure we are able to guide you in the direction that fits your vision best. can reference photos be used to create my ring? Absolutely. If you have a design or idea in mind that is best exemplified with a photograph, we will work with you to make it better than you could have thought possible. There is nothing too complex. Provide any and all reference photos that you believe will help us better deliver the final product you have in mind. 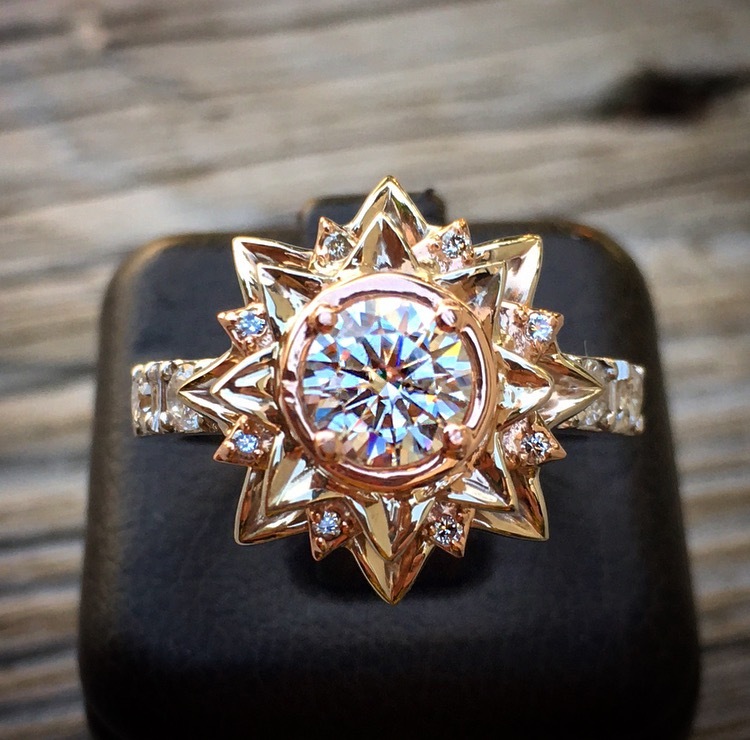 Forget the days of searching for a jeweler with the perfect setting, we can custom build it for you at Ice Storm Jewelry. Can you help me find the right setting? Yes! Having built and designed hundreds of custom one-off settings and rings, we have the experience and knowledge to help you get started. We can work through examples of previous pieces and online references or start from scratch with pencil and paper. Whether a minimalist simplistic style or a more complex setting with accentuating diamonds and a custom build, the answer is simply yes. Yes, we can. Ice Storm requires a 50% deposit prior to the build. All options will be reviewed and design finalized prior to beginning work. Once a final setting design is ready for production and a stone/s selected, we will provide a final quote. A deposit on that amount will be required before proceeding. The process takes between 2-3 weeks. Once the design is finalized and deposit received, the production of the ring from mold to finished product takes around 2 weeks. We ask you allow for up to 3 weeks. We always do our best to make sure that your final product is received as quickly as possible without impacting quality and craftsmanship. Where can i inquire/find more information? Simple, you can visit our inquire and requests page, contact us at icestormjewelry@yahoo.com, or call/text at 862-812-1496.